As my term on the NAAE board is coming to an end in a couple of months, I look back and reflect on what has happened in my life the past five years that I have served on the board. Just as your students are preparing to TRANSFORM at the 89th National FFA Convention & Expo, so can you by checking out all of the opportunities available through NAAE while you are in Indianapolis! DuPont Agriscience Teacher Workshops -- Stop by Room 143, ICC in Teachers' World for inquiry-based professional development workshops, sponsored by DuPont! Learn about solar energy, add color to plant science, investigate lactose and so much more! Click here for full workshop details! NAAE Booth #2172 -- NAAE volunteers and staff invite you to sit down, learn about the new Communities of Practice, and get your free poster of the Ag Teacher's Creed at our booth in the Teacher's World section of the Expo. While you're there, we'll be happy to answer any questions about benefits, upcoming events, or anything else you'd like to know about NAAE membership. Teach Ag Booth #2455 -- Meet the 2016-17 Teach Ag Ambassadors, engage with our partners and sponsors, through the Teach Ag All-Star activity & see the future of ag education at our Teach Ag Signing Day events! Make sure to stop by and find out how to earn at Teach Ag t-shirt! CASE Booth #2165 -- Visit the CASE booth to learn about current and upcoming CASE courses, CASE Online, Lead Teacher opportunities for 2017, and much more. CASE will also have the most up to date listing of 2017 CASE Institute dates and locations posted at the booth. Meet Mentors, Leaders, and the Future of Ag Ed at General Session 5! As ag teachers, we never know how great our influence can be. A kind gesture, a compliment – anything can leave a lasting impression on our students.For Roger King, agriculture teacher at Holmen High School in Holmen, Wisconsin, his entire career as an ag teacher has created quite a ripple effect in the state of Wisconsin.MORE >> Make sure to join us Friday, October 21 at noon for General Session 5 to hear the full story and watch the 2016 NAAE Outstanding Teachers be recognized. It’s Time to Take Your Ag Mechanics Course to the Next Level with CASE! NAAE committees are currently meeting. As the national professional organization for agriculture teachers, we greatly value your input. Consider joining a committee and helping to make a difference and positive impact through NAAE. Follow this link to find out more about serving on a committee in 2017! 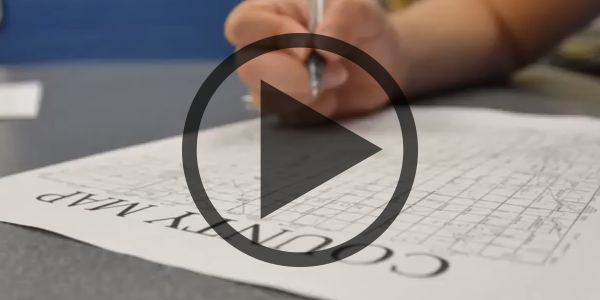 Faced with shortened class periods, McBee developed this lesson to engage students quickly. This interactive lesson groups students together to think critically and problem solve as they manage their own farm. Pest management, unpredictable weather and unforseen farm expenditures are all problems every agriculturalist faces, no matter the location.Click the image above to watch a short video explaining how to implement this idea into you own classroom.The NAAE Ideas Unlimited Award is sponsored by Cengage Learning | National Geographic Learning. Here’s the latest information about NAAE Convention 2016, which is coming up soon – November 29 – December 3. Hope you can join us in Las Vegas! IMPORTANT NOTICE: ACTE is NOT mailing out registration information this year. All materials, including name badges and applicable event tickets will be at the NAAE Registration Desk. Register as a NAAE member for a discount on access to both the NAAE Convention and ACTE CareerTech VISION. One registration covers your attendance at both conferences. Click here for complete registration details. This year, as always, we have a full compliment of learning sessions from which you can choose. We base the topics for our learning sessions on the requests of our members, so it is easy to find professional development that fits your needs. 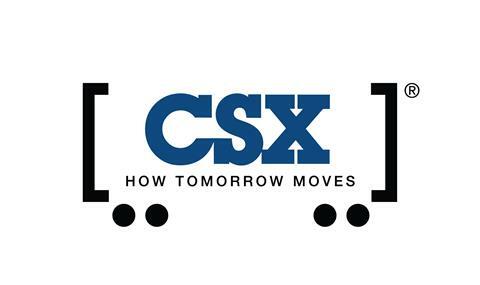 Click here to see the full list of learning sessions. This year's NAAE President Elect Candidates are Nick Nelson, the current NAAE Region I Vice President, and Krista Pontius, the current NAAE Region VI Vice President. Please read each candidate's statement and find their contact information below. Have a news story you would like to share? Send the article to Julie Fritsch, so we can add you to the spotlight! Does Communities of Practice Look Strange? Here's the Fix! Since we've updated Communities of Practice, we have had reports from some people that when they load the site, they get a strange-looking jumble of links and images. Click here to learn more about the issue and how to fix your CoP experience. DuPont Pioneer will award $175,000 in grants to agriscience educators to fund training and classroom resources that will help them implement advanced agriculture curriculum. 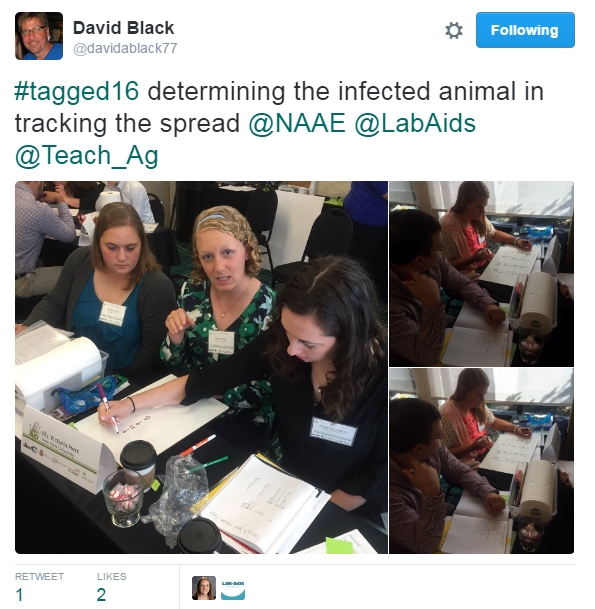 Grant recipients are teachers who are implementing Curriculum for Agricultural Science Education (CASE) in their classrooms. It's a busy time here at the NAAE Office! 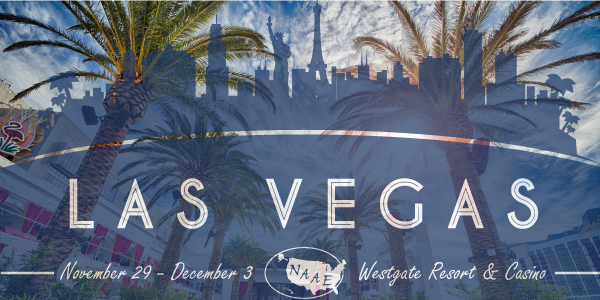 We are preparing to head to National FFA Convention next week and gearing up for an awesome NAAE Convention in Las Vegas in a few short weeks. From professional development, recruitment and retention, and advocacy standpoints, this is a BIG time for us. Make sure to follow NAAE on social media to get the latest on what we are doing, where we are going, and to see where ag ed can take you! This year, 34 preservice agriculture teachers will be engaged in over eight hours of intense, inquiry-based instruction professional development. NAAE is proudly partnering with DuPont to offer the NAPTP at the 89th National FFA Convention, in Indianapolis. On the wall of my childhood bedroom was a picture in a simple wooden frame. Inside the mat, written in script, was the statement, “No matter how great your words may be, you will be judged by your actions and deeds.” As the daughter of an English teacher, a newspaper reporter, and a book editor, I always found it strange that this picture would hang between my bedroom windows. It stood as a reminder to me that I needed to be good, do good, and help others … because no matter how well I could talk my way out of something or write an apology for something I had done, the actions always spoke louder than the words I spoke or wrote. Twenty years (or so) later, as I sit at my desk in my own classroom, I see the Teachers Creed that my students gave me when I first started to teach. The very first bullet on the poster hanging above my desk states, “As a teacher…if you can’t walk-the-walk, we won’t listen when you talk-the-talk.” These words, so similar in meaning to the ones that were displayed in my childhood bedroom, remind me of the importance of deeds and not just words. As a two term president of the New York Association of Agricultural Educators (NYAAE) and the past finance committee chair for the NAAE, I feel that I need to both talk-the-talk and walk-the-walk for the NAAE Agricultural Educator Relief Fundhttp://www.naae.org/resources/index.cfm#relief. I have had the privileged to be a part of this program since its inception and I have seen first-hand how teachers in our profession benefit from it. As the NYAAE president, I sent three requests for funding to support teachers in my state. One instance came from illness and loss of income from a spouse. The second was for a teacher who delivered a baby nearly four months pre-mature and needed to travel to and from the hospital daily. The last went to a teacher friend who lost everything she owned in a fire. Imagine you are in the middle of teaching your morning class and you get a call that your home is ablaze. Everything you own, that you have collected, that you cherish including your pets – lost. As the NYAAE president, getting a phone call to let me know this had happened was devastating. Hearing that the only thing left was what had been carelessly thrown into the drier earlier that morning – a towel, some underwear and socks – made me ache. While it did not seem like much to fill out the request for the relief fund and write some letters to gather support, it was what I could do. It helped this fellow teacher when she had lost everything … when she was at her lowest … when she needed it the most. The purpose of this fund is to help those with the most need – but it cannot continue without of the support of other members. NAAE is seeking support for the fund through our state associations and from individual members. “No matter how great your words may be, you will be judged by your actions and deeds.” Today I choose to walk-the-walk. As a current member of the NAAE finance committee and as a former state association president who requested money to help someone else, I am asking that you choose to make a contribution to the NAAE Agricultural Educator Relief Fund, just as I did. This tax-deductible donation can be made by credit card by calling the NAAE office at (800) 509-0204 or by sending a check made payable to NAAE with “Ag Ed Relief Fund” in the memo line. Please mail check directly to NAAE, 300 Garrigus Building, Lexington, KY 40546-0215. You may also choose to contact your state agricultural education association and make donations in that way. Thank you and please consider supporting because you never know if you will need relief in the future. A man’s favorite donkey falls into a deep precipice; He can’t pull it out no matter how hard he tries; he therefore decides to bury it alive. Soil is poured onto the donkey from above. The donkey feels the load, shakes it off, and steps on it; more soil is poured. It shakes it off and steps up. The more the load was poured, the higher it rose; by noon, the donkey was grazing in green pastures. Agricultural education is often facing many problems, whether it be financial, political, or social, but if we can shake off the problems and learn from them we will step up into green pastures! 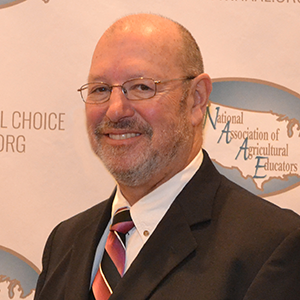 At this year’s National Association of Agricultural Educators’ Conference in Las Vegas, you will be given the opportunity to select who will join our national leadership team as President-Elect. What is really neat is this year, as it has been in recent years, you will have a choice on who will serve you, and I am seeking your vote to serve agricultural education. I was born and raised on a livestock operation that raised sheep and cattle in Southwest Oregon. I am a second generation agriculture teacher, which has taught me along with my own experience that teaching agriculture is as much a lifestyle choice as production agriculture is. After high school I served the Oregon FFA Association as State Secretary and moved on to California to pursue a degree in Agricultural Education at California State University at Chico. I came back to Oregon to earn a Master’s in Education at Oregon State University. In 2002 I started my teaching career at the Sabin Center in the southeast Portland area and created the first small animal curriculum. The following year I moved to Hermiston High School in Northeast Oregon where I taught until 2007. Hermiston was a dynamic program with tremendous community support. While there the program yielded five FFA state officers, 11 state winning teams, 12 American Degrees, 56 State Degrees and one national officer. In 2007, with a young growing family I moved to teaching at the college level at Blue Mountain Community College in Pendleton, Oregon. EDUCATION is the key! However we are facing a major agriculture teacher shortage across the United States and I believe teacher recruitment and retention are the challenges we must find a solution for. We live in an age that is very liberal arts minded, however an economic downturn always puts that into perspective. Agriculture over the past five years is yearning for highly skilled employees, and are willing to pay tremendous wages to individuals that have these technical skills. CTE is in a tremendous position, because we have always provided education for these skills and try to move forward with advancements in technology. Partnerships, both financially and educationally between CTE programs and employers must be promoted and cultivated. In closing, I would like to say that NAAE has been absolutely the best thing that has happened to me in my teaching experience. I believe this organization serves its members well in career/professional development and member support, and above all the unity it provides agriculture teachers—I always see going to Conference as not something I have to do for my job, but a chance to reconnect with my family! I humbly ask you to consider me, Krista Pontius, for president-elect. I believe I have the drive, experience and vision necessary to successfully serve our organization. is no substitute for hard work. It was during elementary school that I realized I wanted to be a teacher so I could inspire others the way that I was encouraged. However the first day of high school, my life was changed forever. From the moment I walked into my agriscience classroom, I knew I found a home where I could couple my passion for agriculture and my desire to teach. Following graduation, I received a bachelor’s and ultimately master’s degree in agricultural education from Penn State University. In 1998, I married my husband, Jason, and we began our farming operation. In 2014, we were able to purchase Cocolamus Farm which had been in his family for nearly 200 years. We milk registered Holstein cows and farm 500 acres of corn, soybeans, wheat and hay. Further, I am a lifelong member of St. John’s Lutheran Church where I was elected to the church council and teach Sunday school. I am also an officer in our local Grange. educational disciplines. Throughout my career, I have supervised ten student teachers and taught agribusiness as an adjunct professor at Harrisburg Area Community College. I also developed an alumni jacket campaign, which has given 3,260 first year FFA members corduroy jackets. My vision for NAAE is to enhance the recruitment and retention of agricultural educators in order to not only address the critical shortage of teachers but also to support teaching veterans in our ever changing profession. Further, I would work to ensure that all members are equipped with advocacy tools to ensure support for their programs in their local communities and beyond. I am grateful for the opportunity to serve as the Region VI Vice-President for the past three years. I have enjoyed visiting our states, meeting colleagues, and working with you to move our profession forward in a positive direction. Again, I ask for your consideration as President-Elect so I can continue to serve NAAE with drive, experience and vision. Please contact me with any questions or concerns (kpontius@greenwoodsd.org or 717.385.6015). 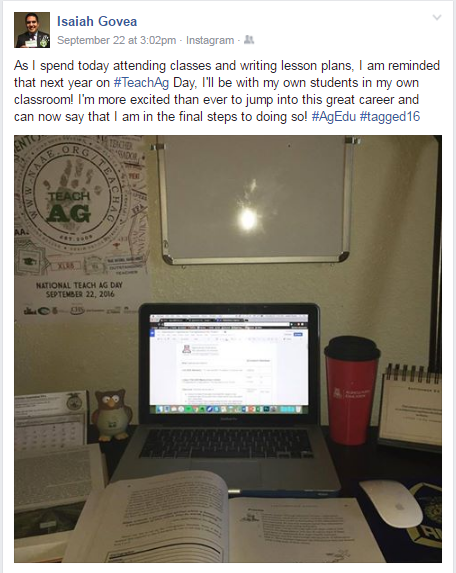 Student teaching – the pinnacle of an aspiring ag teacher’s educational experience and classroom preparation. Every ag teacher can relate to the juxtaposed feelings of excitement and fear for what lies ahead. Although overwhelming, student teaching can be one of the greatest learning experiences for future agriculture teachers. Mr. Cade LeJeune, agriculture teacher at Springfield High School in Springfield, Louisiana, believes in using this experience to help his student teachers take the first steps from nervous and unsure towards becoming established and respected members of the teaching community. Located in a prime strawberry production area of Louisiana, LeJeune aligns his classroom curriculum to meet the needs of the community. His students learn about production agriculture and the marketing therein, as it applies to the local strawberry market. He feels that it is important for ag teachers to help their students understand the local agriculture community as a means to connect with and establish lasting partnerships. Now a graduate of Louisiana State University, Coleman attributes his successes as a new ag teacher at Ponchatoula High School, in Ponchatoula, Louisiana, to the guidance of LeJeune. 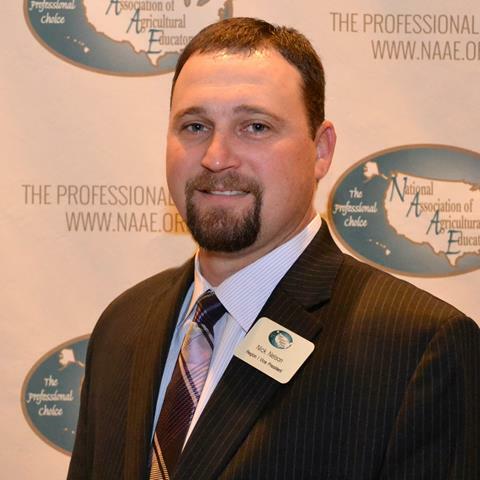 In addition to instilling the importance of community partnerships with his student teachers, LeJeune also encourages them to become actively involved in both the Louisiana Agriscience Teachers’ Association (LATA) and the National Association of Agricultural Educators (NAAE). It is through connections made in both of these organizations that young teachers build relationships with other teacher mentors and each other – essential parts of becoming well-established in the agricultural education community. 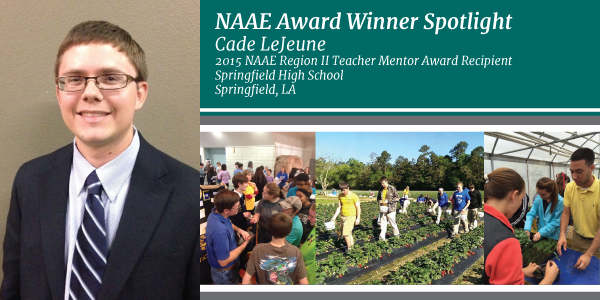 LeJeune’s dedication to providing student teachers with a well-rounded experience in his agriculture program is the reason he was selected at the 2015 NAAE Region II Teacher Mentor award recipient. It is thanks to teachers like LeJeune that our profession continues to grow and develop outstanding teachers. The NAAE Teacher Mentor award program is sponsored by CEV Multimedia. For more information about the award program and to read about all of the 2015 NAAE Teacher Mentor award winners, click here. As ag teachers, we never know how great our influence can be. A kind gesture, a compliment – anything can leave a lasting impression on our students. For Roger King, agriculture teacher at Holmen High School in Holmen, Wisconsin, his entire career as an ag teacher has created quite a ripple effect in the state of Wisconsin. King began his career as an agriculture teacher 32 years ago. 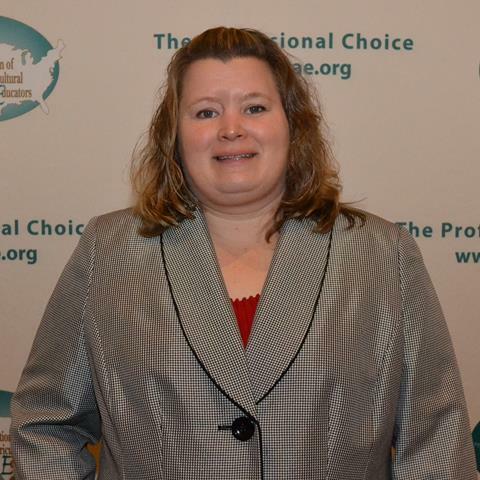 Currently the Wisconsin Teacher of the Year, King has directly impacted the decision of at least three individuals to become agriculture teachers. King’s impact began close to home. 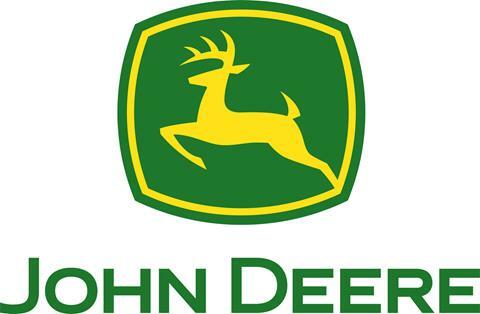 His son, Nathan King, currently an agriculture teacher at Cashton High School, in Cashton, Wisconsin, decided at a very young age to pursue the same career as his father. Growing up in the Holmen agriculture program, Nathan was connected with Troy Talford, who student-taught with Nathan’s dad. Talford later became the agriculture teacher at Sauk Prairie High School, in Prairie du Sac, Wisconsin, where he was the supervising teacher for Nathan during his student teaching experience – small world! The ripple effect continues to spread, as each of these three teachers have former students who have chosen to become agriculture teachers, and are currently majoring in agricultural education at the University of Wisconsin-River Falls begins her journey to become an agriculture teacher. Stories like this are not unique to Wisconsin. Each day that we enter the classroom, our hard work and perseverance as educators touches the lives of our students and creates its own ripple effect. To hear the full story, join us at next week’s National FFA Convnetion and hear Roger, Nathan, Troy and their former students tell their story in person during General Session 5, on Friday, October 21 at noon. The 2016 NAAE Outstanding Teachers will also be recognized during the general session. Congratulations to all of our award winners! See you in Indy!